So you decided to throw a holiday party – a BIG one. This year, you’re inviting all your friends/relatives/customers/clients/random strangers to eat/drink/be merry in the celebration of the holiday of your choice. It is certain to be a memorable event. But if you want those memories to be good ones, you won’t be able to feed your guests with just a bag of red-and-green tortilla chips and a couple of cartons of egg nog. No, you’re going to have a call a pro – a honest-to-goodness caterer. A person whose job it is to turn your party dreams into reality – even if your not quite sure what those dreams are yet. Fortunately, we’ve got numerous caterers in the Chippewa Valley who can help you out. (Check out our listings on page 48.) Before you start making calls, here are some things to know and questions to consider to make your party the best it can be. Tony Draganowski has spent a career in the fine food business, most recently as proprietor of Bijou Catering, based out of his own Bijou Bistro in Eau Claire. He stresses that he tries to be as flexible as possible for his clients. “Every catering event I look at as a blank canvas, and we have to create the picture more or less,” Draganowski says. Whether a client wants to spend $100 per guest or $10 a head, whether they want to serve $600 a case cognac or lemonade and iced tea, Draganowski says he can work within any budget. In other words, know how much you can spend. That being said, potential clients should be able to answer some key questions when they contact a caterer, Draganowski says: Where is the party? How many guests will there be? Will the food be served buffet-style, on plates, or passed out by the waitstaff? Jessica Waters of KP Katering in Eau Claire agrees that the two main pieces of information you should be able to provide a caterer are your budget and head count. In addition, clients should have an idea about how they want the food presented: Will it be full-service (with the caterer providing tablecloths, china dishes, and centerpieces) or basic (with the caterer simply bringing the food)? Every caterer will handle food preparation, set-up, and staffing differently, Waters notes. However, they do it, she says, “With holiday parties, the main question should be regarding food quality and if they have the equipment to ensure hot food is served when the client wants it.” (This is especially important during the Wisconsin winter, when the weather can interfere with both delivery and food temperature.) Some venues or homes have kitchen space where caterers can work, but both Bijou Catering and KP Katering prepare food in their own commercial kitchens and deliver it hot. Whatever kind of food you serve at your shindig, it’s most likely going to be in small servings on small plates. “People rarely do the big sit-down diners anymore,” Draganowski says. Instead, clients and their guests seem to prefer to stand up, eat, and socialize in less-formal cocktail parties. 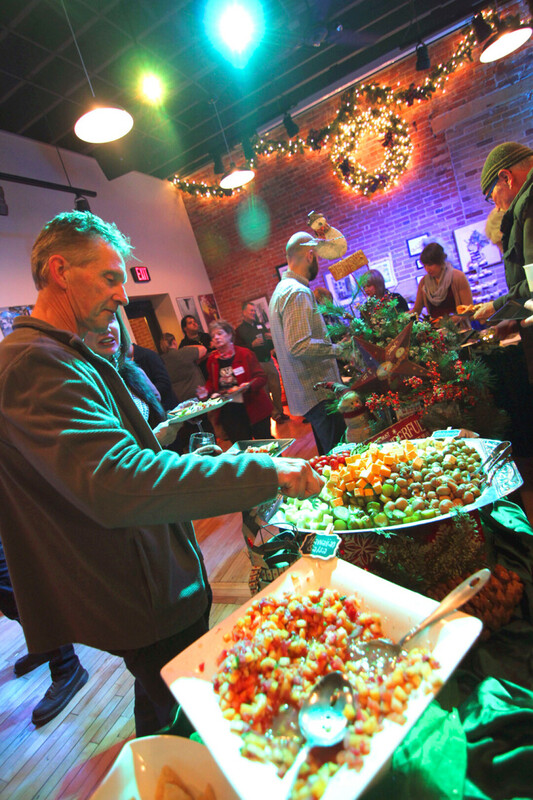 Waters, of KP Katering, agrees that open-house-style events for clients typically feature heavy hors d’ oeuvres, while full-menu meals are more common for corporate employee parties. Overall, strive for balance when you build a menu, he says. If you’ve got a couple of protein dishes, balance them with a few vegetables. Then relax, enjoy the food, and let the caterer create a party to remember.